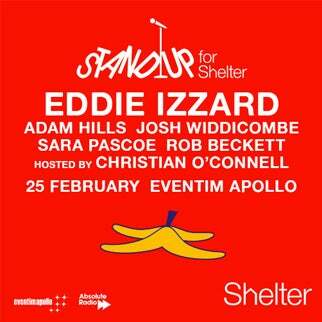 Stand Up For Shelter starring Eddie Izzard, Adam Hills, Josh Widdicombe, Sara Pascoe and Rob Beckett. For one night only, Eddie Izzard takes part in Stand Up For Shelter – an exclusive evening of comedy to raise money for the housing and homelessness charity Shelter. Eddie joins a stellar line-up of comedians including Josh Widdicombe and Sara Pascoe plus more special guests to be announced. The evening will be hosted by Absolute Radio’s Christian O’Connell. 90,000 children are homeless in Britain today, with many forced to live in one room of a hostel or B&B, sharing kitchen and bathroom facilities with strangers and with nowhere to do their homework or even eat dinner. Every penny raised from the event will go towards helping Shelter to make sure that they can be there to support all those struggling with bad housing and homelessness.